This article will briefly review neurothekeoma from a pathology perspective. Based on the amount of myxoid matrix, neurothekeoma is histologically divided into myxoid, intermediate, and cellular types. It is generally agreed that the myxoid variant of neurothekeoma is of neural origin. The cellular variant, however, is of questionable origin, as it lacks both consistent neural immunoreactivity and ultrastructural evidence of neural differentiation. The image below depicts the histologic appearance of a myxoid neurothekeoma. This myxoid neurothekeoma displays a lobulated, nonencapsulated but well-circumscribed proliferation of spindled and epithelioid cells embedded within a myxoid stroma. Neurothekeomas are generally seen to arise in the first 3 decades of life, with a female preponderance. In their study of 178 tumors, Fetsch and coworkers reported patient ages ranging from 20 months to 85 years, with a mean age of 21 years. The male-to-female ratio was approximately 1:2. Similarly, in a study of 133 cases of cellular neurothekeoma, Hornick and Fletcher reported patient ages ranging from 1 to 65 years, with a mean age of 25 years. The male-to-female ratio was 1:1.8. Neurothekeomas most commonly occur on the head and neck. Specifically, the nose and scalp are the most frequent sites of involvement. These regions are followed by the orbital region, cheeks, and chin. The upper and lower extremities and the trunk are other commonly reported sites of involvement. Cases of neurothekeomas occurring in the oral mucosa, paranasal sinuses, and eyelids have also been reported. On cutaneous examination, neurothekeomas appear as asymptomatic to mildly tender, flesh-colored solitary nodules. An associated component of overlying erythema may be present. The nodules are most commonly less than 2 cm in diameter. Neurothekeomas may be mistaken clinically for epidermal inclusion cysts, intradermal nevi, lipomas, pilomatrixomas, or dermatofibromas. On gross examination, neurothekeomas appear as nondistinctive dermal tumors, most commonly measuring 0.5 to 1 cm in dimension. 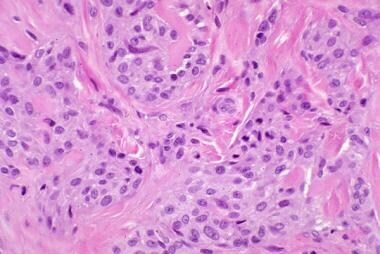 Histologically, neurothekeomas consist of spindled and epithelioid cells with abundant eosinophilic, finely granular cytoplasm. The cells are situated in multiple, closely spaced nodules of varying sizes within the dermis. Higher power view of the myxoid neurothekeoma from the previous image demonstrating the random growth pattern. 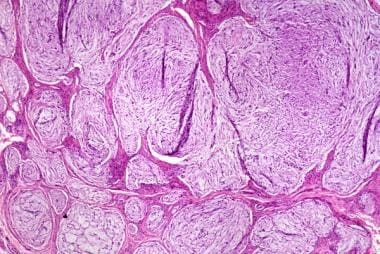 The cellular subtype is a poorly circumscribed tumor involving the superficial dermis with possible extension into the superficial subcutis. Infiltration into fat and entrapment of skeletal muscle can be seen. 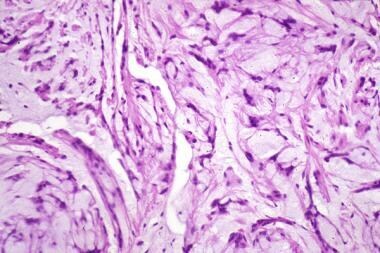 The tumor consists of nests and fascicles of epithelioid cells with vesicular nuclei containing scant myxoid stroma (see the following image). Due to the fact that the myxoid element determines the size of tumor nodules, the nodules of cellular neurothekeoma are smaller than those of the myxoid subtype. Although the myxoid variant of neurothekeoma is hypocellular, the cellular subtype is hypercellular. Sclerotic collagen is seen more markedly in cellular than myxoid tumors. 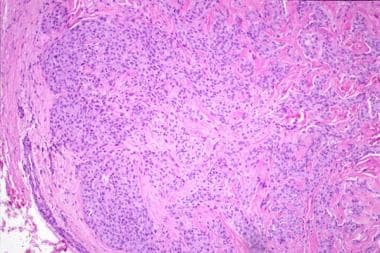 Osteoclastic giant cells are seen in a minority of cases. Perineural and vascular invasion may rarely be seen in cellular neurothekeoma. Cellular neurothekeoma can be histologically mistaken for melanoma and is, therefore, important to recognize. 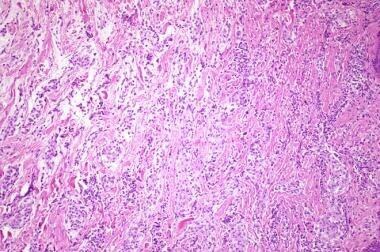 Also included in the histologic differential diagnosis are Spitz nevi, smooth muscle tumors, fibrohistiocytic tumors, and carcinomas. Tumors with features of both cellular and myxoid variants are termed intermediate type. In contrast to the random growth pattern seen in myxoid neurothekeoma, cellular and intermediate variants demonstrate a whorled growth pattern. See the images below. Higher power of the cellular neurothekeoma in the previous image demonstrating a whorled growth pattern. An intermediate-type neurothekeoma demonstrates features of both cellular and myxoid variants. NK1/C3, an antibody that stains neuroectodermal tissue, has been shown to stain cellular neurothekeoma. PGP9.5, a broad marker for neuroectodermally derived tumors also demonstrates positivity in cellular neurothekeoma. However, these 2 markers are not specific for cellular neurothekeoma and stain other lesions which enter into its histopathologic differential. For this reason NK1/C3 and PGP9.5 are not helpful when making a close distinction. Sixty percent of cellular neurothekeomas have shown positivity for smooth muscle actin (SMA); cellular neurothekeomas are usually diffusely positive for neuron-specific enolase (NSE). In a different follow-up study of 69 cases of cellular neurothekeoma, 10 tumors recurred locally. No tumor recurred more than once, and all recurring cases had been marginally excised or had involved excision margins. The only features that correlated with recurrence were positive excision margins and head and neck location. No metastases were reported. Follow-up studies of atypical cellular neurothekeomas have not shown that the presence of increased number of mitoses or cellular atypia correlates with any clinically significant endpoints. Large tumor size, atypical histologic features (high mitotic rate, pleomorphism, infiltration of adipose) have been shown to have no clinical significance. Therefore, it is regarded that cellular neurothekeomas behave in a benign fashion and only occasionally recur, generally in the setting of incompletely excised lesions on the face. Harkin JC, Reed RJ. Solitary benign nerve sheath tumors. Harkin JC, Reed RJ, eds. Tumors of the Peripheral Nervous System. Atlas of Tumor Pathology. 2nd ed. Washington, DC: Armed Forces Institute of Pathology; 1969:60-4. Gallager RL, Helwig EB. Neurothekeoma--a benign cutaneous tumor of neural origin. Am J Clin Pathol. 1980 Dec. 74(6):759-64. [Medline]. Fetsch JF, Laskin WB, Hallman JR, Lupton GP, Miettinen M. Neurothekeoma: an analysis of 178 tumors with detailed immunohistochemical data and long-term patient follow-up information. Am J Surg Pathol. 2007 Jul. 31(7):1103-14. [Medline]. Fetsch JF, Laskin WB, Miettinen M. Nerve sheath myxoma: a clinicopathologic and immunohistochemical analysis of 57 morphologically distinctive, S-100 protein- and GFAP-positive, myxoid peripheral nerve sheath tumors with a predilection for the extremities and a high local recurrence rate. Am J Surg Pathol. 2005 Dec. 29(12):1615-24. [Medline]. Hornick JL, Fletcher CD. Cellular neurothekeoma: detailed characterization in a series of 133 cases. Am J Surg Pathol. 2007 Mar. 31(3):329-40. [Medline]. Argenyi ZB, Kutzner H, Seaba MM. Ultrastructural spectrum of cutaneous nerve sheath myxoma/cellular neurothekeoma. J Cutan Pathol. 1995 Apr. 22(2):137-45. [Medline]. Pulitzer DR, Reed RJ. Nerve-sheath myxoma (perineurial myxoma). Am J Dermatopathol. 1985 Oct. 7(5):409-21. [Medline]. Barnhill RL, Mihm MC Jr. Cellular neurothekeoma. A distinctive variant of neurothekeoma mimicking nevomelanocytic tumors. Am J Surg Pathol. 1990 Feb. 14(2):113-20. [Medline]. Zelger BG, Steiner H, Kutzner H, Maier H, Zelger B. Cellular 'neurothekeoma': an epithelioid variant of dermatofibroma?. Histopathology. 1998 May. 32(5):414-22. [Medline]. Ward JL, Prieto VG, Joseph A, Chevray P, Kronowitz S, Sturgis EM. Neurothekeoma. Otolaryngol Head Neck Surg. 2005 Jan. 132(1):86-9. [Medline]. Vij M, Jaiswal S, Agrawal V, Jaiswal A, Behari S. Nerve sheath myxoma (neurothekeoma) of cerebellopontine angle: case report of a rare tumor with brief review of literature. Turk Neurosurg. 2013. 23(1):113-6. [Medline]. Alghamdi KM, Al-Mubarak LA. A myxoid neurothekeoma of the nose. J Drugs Dermatol. 2012 Feb. 11(2):252-5. [Medline]. Stratton J, Billings SD. Cellular neurothekeoma: analysis of 37 cases emphasizing atypical histologic features. Mod Pathol. 2013 Nov 1. [Medline]. Zedek DC, White WL, McCalmont TH. Desmoplastic cellular neurothekeoma: Clinicopathological analysis of twelve cases. J Cutan Pathol. 2009 Nov. 36(11):1185-90. [Medline]. Andea A, Satter E, Benbenisty K, Argenyi Z, Metcalf J. Atypical epithelioid cellular neurothekeoma: case report with immunohistochemical and ultrastructural studies [abstract]. Presented at: International Society of Dermatopathology (ISDP) 8th Joint Meeting; February 16-17, 2005; New Orleans, La. Am J Dermatopathol. 2005;27:529. Plaza JA, Torres-Cabala C, Evans H, Diwan AH, Prieto VG. Immunohistochemical expression of S100A6 in cellular neurothekeoma: clinicopathologic and immunohistochemical analysis of 31 cases. Am J Dermatopathol. 2009 Jul. 31(5):419-22. [Medline]. Wang AR, May D, Bourne P, Scott G. PGP9.5: a marker for cellular neurothekeoma. Am J Surg Pathol. 1999 Nov. 23(11):1401-7. [Medline]. Calonje E, Wilson-Jones E, Smith NP, Fletcher CD. Cellular 'neurothekeoma': an epithelioid variant of pilar leiomyoma? Morphological and immunohistochemical analysis of a series. Histopathology. 1992 May. 20(5):397-404. [Medline]. Fullen DR, Lowe L, Su LD. Antibody to S100a6 protein is a sensitive immunohistochemical marker for neurothekeoma. J Cutan Pathol. 2003 Feb. 30(2):118-22. [Medline]. Stratton J, Billings SD. Cellular neurothekeoma: analysis of 37 cases emphasizing atypical histologic features. Mod Pathol. 2014 May. 27 (5):701-10. [Medline].